Imagine waking up to the music of a mountain stream flowing by your cabin -- except that your cabin is 50 feet up in a giant cedar tree with a view seen only by the birds. You're living in the tree canopies of a lush evergreen forest. You can see for miles. A great blue heron glides silently over the rushing creek far below. The sun splashes through a skylight and illuminates a mammoth tree trunk growing straight up through the floor of your two story treehouse and disappearing through the ceiling. 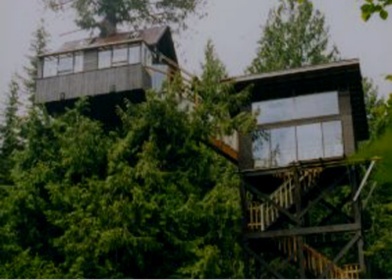 Cedar Creek Treehouse is an Earth-friendly, privately owned and operated mountain retreat, located one mile as the crow flies, 10 miles by car, from the Nisqually River Entrance to Mount Rainier National Park, and bordering the Gifford Pinchot National Forest. 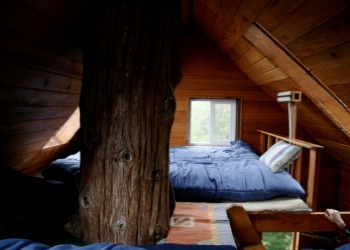 We offer unique treehouse vacation rental lodging with this "bed and breakfast" cottage 50 feet up in a 200-year old Western Red Cedar tree. And with the new addition of our Treehouse Observatory (and its "Stairway to Heaven" access) -- giving you spectacular mountain views 100 feet high in a nearby fir tree -- we are redefining the concept of a treehouse resort. 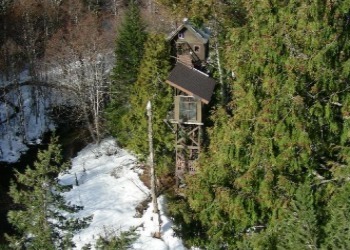 Cedar Creek Treehouse is "off the grid" and uses a small solar powered system. The treehouse features plenty of windows and skylights, tongue and groove cedar siding, a sweeping view of the creek below, and breath-taking southern and western sky vistas. Swimming and trout fishing are literally in your front yard, as is a garden to enjoy. The fourth floor of the stairwell is a glass-enclosed observation area, with lots of possibilities: stargazing, cloudwatching, bird-watching, music studio, or just swinging in a hammock and enjoying a book. And all of this in quiet, arboreal solitude.